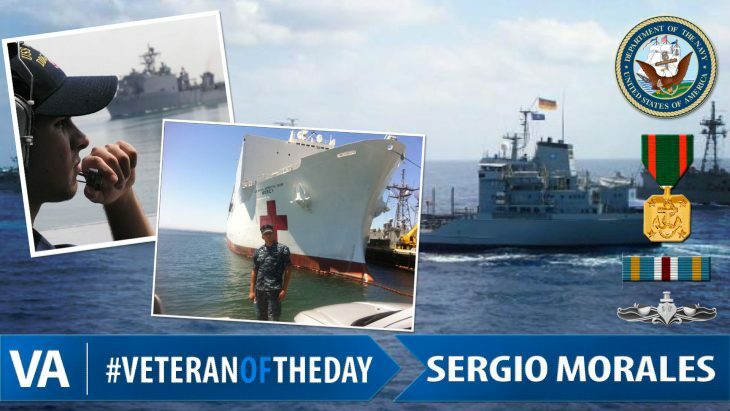 Today’s #VeteranOfTheDay is Navy Veteran Sergio Morales, Jr.
Sergio served from 2004 to 2012 earning a CS2(SW) rate. He spent time serving on the USS Stout, USS Gonzalez, and the USS Lebanon. He also was stationed at 29 Palms. While at 29 Palms, Sergio served his final tour onboard USS Mercy, a naval hospital ship out of San Diego. The Mercy only has a skeleton crew, so it requires pulling an assortment of Servicemembers from four branches to fully deploy. The Mercy deploys for humanitarian use, including bringing medical services to other countries. Sergio recently graduated from American University with a Bachelors of Science in Environmental Science. Thank you for your service, Sergio!